With non-slip backing. Use in your cabinet to keep plates organized, and to stop them from sliding and rattling. 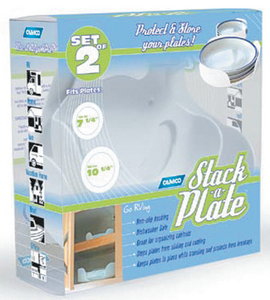 Plates stay in place while traveling and are more protected from breakage. Set of two-one fits plates up to 7-1/4"; the other fits plates up to 10-1/4". Dishwasher safe.